Outnumbered, outmaneuvered and outgunned. Perfect. The enemy forces hurl themselves at my already battered barricades. I ready the last of my ragtag army near my central base. Many of them are injured; all of them will die soon - entirely in vain, except for the fact that I have a massive, cheesy grin on my face. Gloating messages of victory arrive from my opponent, not the least of which is "gg tho." For me, however, the victory is mine. I lost. But that's the win. I believe gaming is at its best when we face not just daunting challenges, but literally impossible ones where defeat is inevitable. We constantly pit ourselves against them, again and again, with an expression of grim stoicism. It's not a phenomenon exclusive to videogames, either - my falsely heroic ideals undoubtedly have their root in the reality of the Last Stand. Certainly, in the real world, the Last Stand has achieved an almost mythical status. Every person reading this will have had a famous military loss pop into their head, be it the Alamo or Little Bighorn for U.S. citizens or the Charge of the Light Brigade during the Crimean War for Brits. Almost every nation has one, and it's curious how some glorify them. My country, the U.K., reigned over the largest empire in human history only 100 years ago. That naturally came about through a constant series of military victories, yet we remember very few of them. What we do remember are our "heroic" rear guard actions, hundreds of miles from home against crazed foreigners, culminating in the grueling defense against the greatest evil, Nazi Germany. Of course, this is all nonsense. Last Stands are generally hideous massacres, large wastes of human life and often the results of poor planning. Yet they hold enormous appeal when manifested in videogames. To anyone watching us play, our pleasure might not be recognizable. Constant defeat, no matter how hard we try, often has the same symptoms: At death number one we grumble and continue; at death number two we swear and sit up straight, a malignant look in our eye; at death number 200, we roar with anger and declare that the computer is "cheating" as the controller moves with great velocity in a random direction. One might reasonably ask why we put ourselves through this obvious frustration. The answer is in the subtle enjoyment we all feel when we somehow survive that impossible predicament. 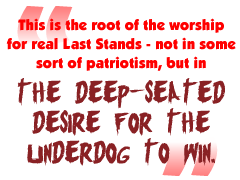 This is the root of the worship for real Last Stands as well - not in some sort of patriotism, but in the deep-seated desire for the underdog to win. For centuries, the best fiction has had its protagonists pushed right to the brink of defeat, against insurmountable odds, only to rise victorious. To place ourselves at the heart of this dramatic arc is the logical next step. Call of Duty, for example, often pits you against impossible odds where, especially on harder difficulty settings, you will die time and time again. You restart at the last checkpoint and, if you're anything like me, try the exact same tactic again with similar results. You are an infinite, unstoppable human wave of one, coming closer to victory with each gruesome death.